Boom! makes a little bit of a return to its early roots with Curse, a new horror comic from writers Michael Moreci and Tim Daniel and artists Riley Rossmo and Colin Lorimer. With a creative team like that, it’s no wonder Boom! jumped at the chance to let them tell their kind of werewolf story. In Curse, a father must sit idly by while his son deals with a life threatening disease. Strapped for cash and out of work, Laney Griffin takes to hunting the mysterious person, or beast, that’s been responsible for several murders in the last few months. One night Laney actually finds the creature and captures it, hoping to use its curse to save his son. While it’s difficult to see where one writer’s contributions end and where the other starts, I think it’s safe to say that Moreci and Daniel are working quite well as a team. The story feels personal, the struggle of a father to save his son even as he feels powerless, and even with that personal tone, the sudden appearance of a werewolf doesn’t seem out of place. The sense of horror, the unknown, is thick in certain parts of the story. It goes beyond the gore, but the sense of unknown dread comes through in the mood of the story. 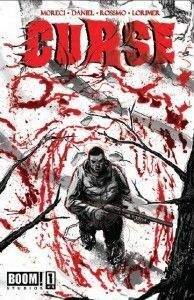 Moreci and Daniel may have just written some of the best creator-owned horror since 30 Days of Night. Rossmo and Lorimer share art duties, with Lorimer illustrating the bulk of the story and Rossmo illustrating portions that focus on the werewolf. Lorimer’s slick, cleaner looking art looks great for the “real world” interactions among the human characters while Rossmo’s wilder, more frenetic style is perfect for the scenes that feature a savage werewolf acting on his feral impulses. The balance and dichotomy is executed perfectly, with each style and artist feeling right at home in their respective scenes, but with the transitions not being too dramatic to the cohesive feel of the comic as a whole. Curse might just be the first big creator-owned book launched in 2014. The creative team is one that fans can only dream of and they execute the book so very well. If issue 1 is any indication, this miniseries will be a big deal. Parental Concern: Blood, guts, gore. Probably not for the kids. should be proud of all your accomplishments. I haven’t seen you in such a long time, But I do see your work every so often. Well Happy 2014 and keep up the good work. A Fan! p.s By the way I’m Aunt Kathys sister Ann and “Lil”Patricks Aunt & Godmother. Loved this as well. Really great time to be a horror comic fan! Sam (Corey Haim from the classic movie Lost Boys) sure would be missing out.